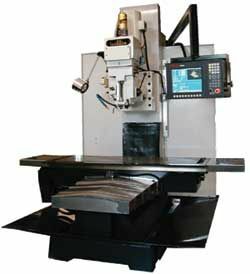 Willis Machinery and Tools offers heavy duty, tool-room style, CNC bed mills like the “Willis” BTM-50 from the Willis BTM series. Large work-piece and weight capacities, along with heavy milling and drilling capabilities, the “Willis” bed mills both BTM series and RTM series present an unbeatable value for our customers. All of our CNC bed mills are designed and constructed using the latest technology, and are built from the highest quality materials and components available. “Willis” Bed Mills feature a rigid meehanite cast base, column, and saddle. These vertical travel CNC mills utilize wide, ground, and hardened ways (not linear), providing maximum rigidity and load bearing characteristics. Turcite coats the adjacent way surfaces. A metered, automatic lubrication system with low-level alarm provides oil to the CNC machine’s slide ways, as well as, to the X, Y, and Z ball screws. Oversize, high precision ball screws are mounted in precision bearings, ensuring long life, superior cutting performance, and great accuracy from our CNC bed mills. Our BTM series CNC bed mills are offered with a 2-piece rear splash guard, chip pan, and steel telescoping way covers. An optional table mounted splash guard with sliding doors is also available on these CNC mill machines for sale. The mill head is equipped with a high/low gear range for maximum power and torque throughout the entire spindle speed range. The spindle motor is equipped with an AC digital “Yaskawa” inverter drive for peak performance. A flood coolant system is standard equipment on the Willis CNC VMC. The mill head tilts 90° left and right maintaining its rigidity from front to back. The CNC bed mill's column is thick and ribbed for maximum rigidity. Our CNC vertical bed mills also provide an extra long bolster in order to support the head’s rigidity. The “Fagor 8055” CNC control includes, conversational programming and G-code conversion capabilities.